Abso-freakin-lutely BRILLIANT! Many MANY thanks to Kristen Simmons and her awesome publicist for giving me a copy! I've been waiting to read Article 5 for months and I definitely was not disappointed! United States is not as we know it. After a horrible war, the country's structure has completely changed and The Bill of Rights has been replaced with the Moral Statues that control practically EVERY personal aspect of a citizen's life like his religion,family,interests and even his clothes/belongings! But it wasn't always this way. 17 year old Ember remembers a time when America valued freedom and although she hates how things have changed, she's looking to survive. So, like any sensible person, she blends in and tries not to draw unnecessary attention to herself. It doesn't last very long though. Ember's whole world falls apart when her mother gets arrested for not adhering to Article 5 of the Moral Statues and what makes it worse is that one of the arresting officers was Chase Jennings - Ember's ex-boyfriend and the only guy she has ever cared about. I went through a whole range of emotions while reading Article 5. I was angry, REALLY really angry with the statues, the soliders and all the sh*t Ember went through. I'm embarrassed to admit that I even shed a few tears some times (yeah, I cry for books :P ), mostly when I saw the cruelty that Ember faced. And then there's Chase Jennings..where do I begin? He's a complex, enigmatic guy, in fact he's so hard to read that at first even Ember doesn't understand him completely , despite knowing him for years. I got goosebumps while reading about Chase. "I could not fall back in love with Chase Jennings. Doing so was like falling in love with a thunderstorm. Exciting and powerful, yes. Even beautiful. But violently tempered, unpredictable, and ultimately, short-lived." I could connect with Simmons' writing on so many levels, it's unbelievable. 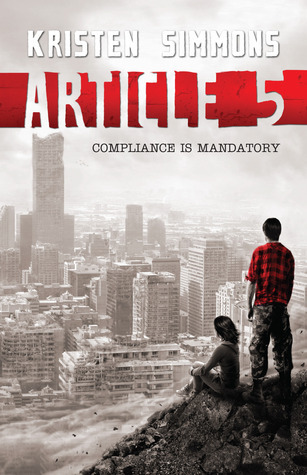 Article 5 has got everything a good book needs. I got attached to the characters, excited by the plot, felt a whirlwind of emotions that I absolutely could not put the book down! Trust me, the book's so good that you'd feel the same way too! After Legend, every dystopian novel that I tried reading has let me down..until Article 5! Oh, this does sound awesome! I'd heard positive things about this book and now another good review! I can't wait to get a chance to read it. Thanks for a great review!